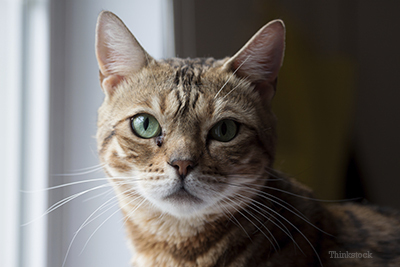 Sam, a beautiful, 6-year-old Bengal, sustained an injury to his ankle while wandering outdoors. Being attacked by an animal or getting caught in a trap were possible causes. He ended up with a badly infected and dislocated ankle. That's how I met Sam. We explored his ankle, literally scooped out pus from the joint, and despite the odds, we repaired the dislocation successfully. A splint was placed on the leg to reinforce the repair. Initially, the splint was changed daily until we were convinced that the infection was under control. The plan after surgery was simple: 8 weeks of strict confinement to a large crate, with weekly bandage changes. The owner sounded smart and seemed totally dedicated to her beloved cat’s recovery. Little did I know what would actually happen over the following weeks. Sam's owner felt so bad keeping him confined, that she let him walk around the house for two hours every day! But Sam, amazingly, did well. The weekly bandage changes were uneventful. The owner's impression probably was that I was just a mean surgeon trying to unnecessarily lock up her poor cat in a crate for 8 weeks. Because there were no immediate negative consequences, her decision to give him freedom soon felt right to her. During week 5, on a beautiful, warm evening — birds chirping and all — Sam's owner thought it would be nice to put a comfortable pillow on the deck to let Sam enjoy the scenery while the family ate dinner next to him. Needless to say, this was in complete disagreement with everything we had discussed several times, before and after surgery. Once dinner was over, the family put the dishes away. When they came back, surprise, there was no Sam to be found! All that was left on the deck was the comfortable pillow and the splint! The family went out to look for Sam, who was eventually found hiding under the deck. After they caught him, they rushed him to the emergency clinic to have the splint replaced. The emergency veterinarian felt the leg, which didn't seem right. X-rays soon revealed that the ankle was dislocated again! So we were back to square one! What do we do now? Tell the owner "I told you so?" Repeat the operation to fix the dislocation, with no convincing evidence that they would do a better job this time around. Surprisingly, or maybe not surprisingly, the owners decided to amputate the leg. I called the owner before surgery, as I always do. Acting as cool as a cucumber and refraining from expressing any anger, frustration or discouragement, I candidly asked what happened. To my surprise, the owner volunteered the whole story, and confessed what she had been doing for the past 5 weeks. She actually said, "I really messed up and I'm sorry I let you down." Actually, she let Sam down; she said she would take full responsibility for her mistake. I guess I will never understand why some pet owners follow my post-op discharge instructions so poorly. They pay a good chunk of money for the procedure and we discuss post-op care thoroughly before surgery. They say that they will do whatever it takes to help their pets and I remind them of what needs to be done when we talk after surgery. They also receive written, detailed, tailored discharge instructions, and I am available in the event of any confusion. Still, sometimes instructions simply aren’t followed. Now, please keep in mind that this cat owner is perfectly sweet and seemed plenty reasonable and intelligent. She is absolutely, positively not a bad owner and she clearly loves her cat. But she didn't believe that the strict discharge instructions were there for a reason. Instead, she had to pay for a second anesthesia and a second surgery. Ironically, poor Sam had to wear a plastic cone around his head and be crated for a few more weeks — all of this in addition to losing his leg. I will always remember Sam’s story, and I feel terrible thinking that he could have kept his leg if only the owner had followed instructions. Sam is the poster cat for a “lose-lose” situation, when it should have been a win all around.